Most cages sold for guinea pigs are too small! And unfortunately, we have heard many stories of people with depressed guinea pigs, merely because they were living in guinea pig habitats that were too small. 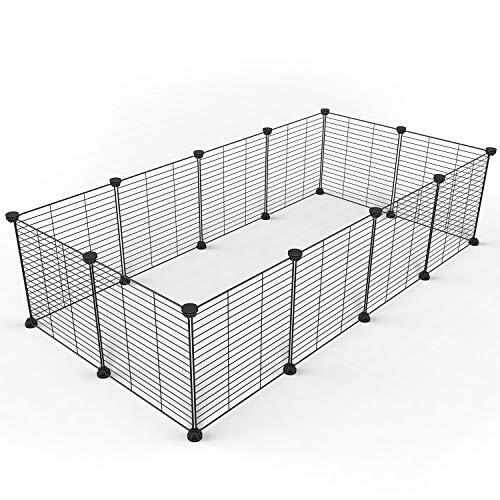 … for the sake of you and your guinea pig If you’re in a hurry, you can find our pick of the best guinea pig cages right below the cut. Below this, you’ll find an extensive guide on how to set up your guinea pig cage. After researching more than 30 different kinds of guinea pig (and rabbit!) 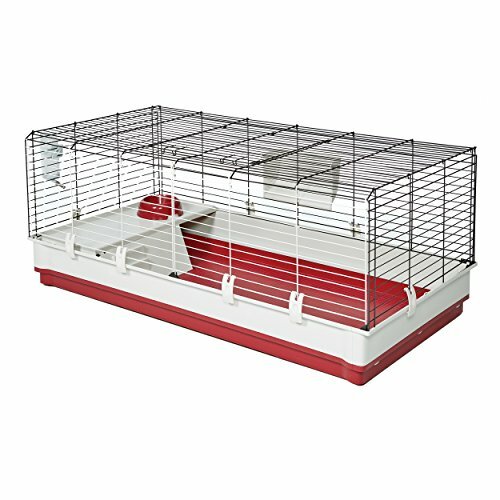 cages, we have found the best, large guinea pig cages that we can recommend to all guinea pig owners out there. These cages are simply the best options, and large enough to host two guinea pigs. From an animal care standpoint there is no argument for not getting the c&c cage. The main reason most don’t get this is needing a more typical cage that is easier to move. If you’re looking for a traditional indoor cage, our budget pick is from Midwest, the same company that makes the Guinea Pig Habitat Plus we reviewed above. Lots of accessories: The cage comes with a hay rack, food bowl, water bottle and the elevated feeding area. This makes it a one-stop shop and makes sure you don’t forget to get anything. Easy to clean: The two side doors span the full width of the home, making it easy to clean. In addition, there is a large top door if you just want to take your piggies out for play-time. Easy to move: The cage is quite sturdy and easy to move (especially compared to the c&c cage). Amazon themselves has recently entered the world of guinea pig cages and they’ve done so with great success. It comes with many of the same attractions as the Midwest home for Pets above, being the same size, having the same accessories and being easy to clean and move. In addition, both are very easy to assemble. Instead of repeating ourselves we want to point out a few differences between the two cages instead. The Amazon cage cannot be expanded in the same way the above cage can. As such, if you think you might be getting more piggies in the future, go for the Midwest cage. The Amazon cage has a larger feeding area. This has a couple of advantages. Having a larger feeding area in itself provides more space, both on the top and the lower deck and many pigs like the added privacy of a larger hideout below. We don’t consider this cage as a starter cage. It is more of an immediate-need-for-a-cage type of situation and should be replaced as soon as possible. Because of the very limited amount of space, it is not recommended that this habitat be the permanent and long time cage of even one guinea pig because it limits its movement which is against their natural character. It will be an effective quick fix since it comes with the basic accessories such as the water bottle, food bowl, hay feeder and the platform that will serve as the feeding area. There is also a space underneath the platform to serve as the private space for your pet. Cleaning this cage will be easy since it is just a small cage and the door on the front opens the full width. We love that the Tespo Pet Playpen can be very versatile. You can set it up as a playpen or you can also set it up to be the permanent habitat of your pet. However, you may have to purchase another set if you decide to make this a long-term home so you can make a roof. That is to make sure that your guinea pet cannot climb and escape. The additional set, aside from using it as a roof, may also be used to make a second level to make a bigger space for your pet to explore. More space means more fun! This doesn’t have a plastic base to put the beddings and catch the urine and faeces. However, you can purchase a separate plastic base or a coroplast and set it up inside this roomy playpen. This one is actually not a cage but a tool that can be useful for your cages especially if you have one that doesn’t have a good quality base or a base that has already deteriorated. Coroplast is corrugated plastic. Based on research, it has been used as guinea pig cage material for more than 15 years already and so far, there has not been any report that it caused injury or illnesses. This is a sturdy material that can easily be sliced and cut with a craft-knife, heavy-duty scissors or razor blade. The best characteristic of this product is, you can customize and cut it based on your desired shape and size to fulfil whatever you need and want for your pet’s cage. Coroplast is a waterproof, solvent and stain resistant product. It can last for years and may even last longer if properly maintained and cleaned. 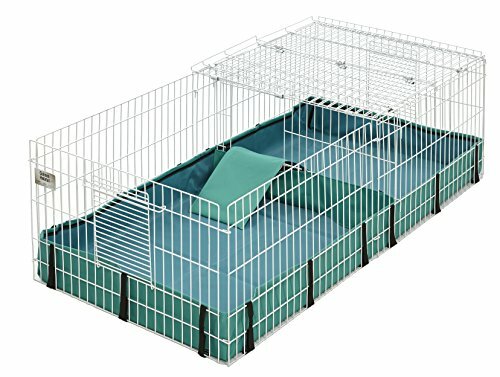 How large should a guinea pig cage be? 1 guinea pig: 5 square feet cage (minimum) size. Unfortunately, there are a lot of cages out there with a smaller size. In this article, you’ll see that all the cages we recommend are larger than what is needed for 2 guinea pigs. 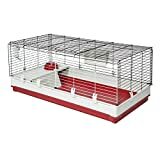 If you want to house more than two guinea pigs, you should opt for c&c cages, as these are the easiest ones to expand. C&C Cages (for Guinea Pigs) – and what is a C&C cage? The definition of a C&C cage is “cubes and coroplast”. The first C comes from the frame and wire portion of the cage is built from wire grids. Or in other words, the cubes. You can build a c&c cage yourself, however, it can be hard to get the material. Also, you want to make sure that both cube and coroplast are safe for your guinea pig, which can require a lot of research. If you're looking to make a DIY guinea pig cage, you'll need cubes and you'll need coroplast. Below are the best options we have found. We recommend getting two of these to be on the safe side. Upgrade version: cable ties and anti-slip pieces added in. Cable ties help build doors or ramps or reinforce the whole structure. Anti-slip pieces prevent connectors from slipping on the floor. In terms of coroplast, it is very important you get the correct kind. The item below lives up to all requirements and will have more than sufficient floor space. 4mm, white fluted polypropylene Guinea Pig cage blanks designed for indoor cage use. Waterproof, solvent & stain resistant. 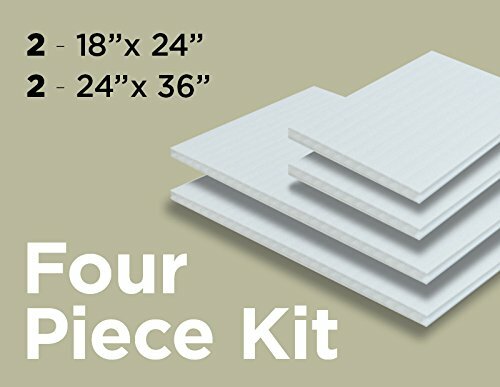 Our Guinea Pig Coroplast package is ideal for temporary walls and partitions. 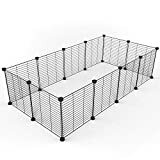 If you need a large guinea pig cage to house 4 or more guinea pigs, you’ll need at least 13 square feet of ground area for your piggies. It can be rather hard, if not impossible to find a classical cage this size, and you will have to go with a c&c cage instead. Assemble a cage yourself. We recommend getting the Tesco Playpen and the coroplast for guinea pig care. Back in the days, you often overpaid for guinea pig cages that were too small, of poor quality and hard to clean. Back then, you pretty much only had the local pet store to rely on. Luckily (for both owner and guinea pigs) that is no longer the case and today, there are a lot of good and cheap options out there. 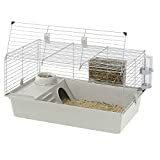 However, if you are to invest in a properly sized guinea pig cage with at least 7.5 square feet of space, the truth is, that it is associated with a cost but a cost, that is affordable for most, and you should be prepared to spend more on guinea pig hay and food than you do for your cage. With this said, our pick for a budget cage is the Midwest Home for Pets. It comes with a lot of value for the price, and the inclusion of hay rack, water bottle, food dish and the elevated area will likely save you a lot of money compared to cages without this build in. Temperature: Guinea pigs need a constant temperature of 60-75 degrees Fahrenheit. This is hard to provide outside. Low and stable humidity: Guinea pigs like a low and stable humidity (they come from the plains in the wild). Fluctuations in- and high humidity is just as bad for a guinea pig as a high temperature. This means you should place the cage inside with stable humidity and not in a garage or close to laundry rooms or showers. Draft free: Drafts are bad for guinea pig health and they can get infections from drafts. A Food bowl. Ceramic food bowls work the best as they are un-tip-able and un-chewable. You should get one for each piggy you have. A house to hide in. These are important as your piggy needs a place where it can sit while feeling secure. Again, you’ll need one house per pig. If you are unsure what to get, we have covered house accessories and toys here. One of the things you simply must do as a guinea pig owner is cleaning the cage, and unfortunately, there is no easy way around this. We hope you’ve enjoyed this guide to the guinea pig case. As you can see, there are unfortunately a lot of (too) small guinea pig cages out there, but with our guide, you can easily bypass these.